Temperature dependence of SHG intensity for NaRTiO4 with R = La, Nd, Sm, Eu, Gd, Dy, Y, Ho. The inset shows the NaRTiO4 pellet samples. Penn State MRSEC DMR-0820404, DMR-1210588, Japan Society of the Promotion of Science (JSPS) Fellowship (No. 22-1280 and No. 25-185, and grant No. 25249090). Hirofumi Akamatsu,a Koji Fujita,b Toshihiro Kuge,b Arnab Sen Gupta,a Atsushi Togo,b Shiming Lei,a Fei Xue,a Greg Stone,a James M. Rondinelli,c Long-Qing Chen,a Isao Tanaka,b Venkatraman Gopalan,a and Katsuhisa Tanakab. aPennsylvania State University, bKyoto University, cDrexel University. 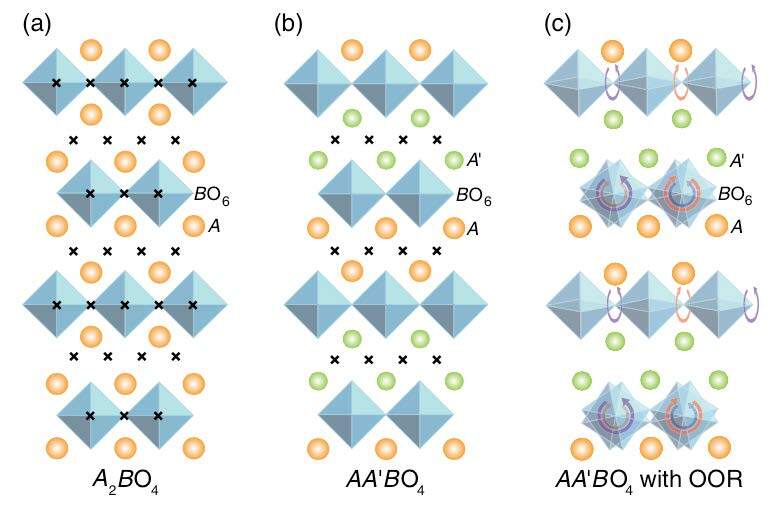 Rotations of oxygen octahedra are ubiquitous in ABO3 perovskites, but they cannot break inversion symmetry in simple perovskites. However, in a layered oxide structure, this is possible, as we demonstrate here in A-site ordered Ruddlesden-Popper NaRTiO4 (RE; rare earth), previously believed to be centric. As shown in panel (a), a simple n=1 RP phase A2BO4 possesses inversion centers (marked as x’s). These inversion centers at the B sites are removed in the A-site-ordered structure with P4/nmm space group in panel (b). The remaining inversion centers can be removed by oxygen octahedral rotations as shown in panel (c). By revisiting this series via synchrotron x-ray diffraction, optical second-harmonic generation (panel (d)), piezoresponse force microscopy, and first principles phonon calculations, we find that the low-temperature phase belongs to the acentric space group P-421m, which is piezoelectric. This study suggests that other A-site-ordered n=1 layered phases including ARTiO4 (A=H, Li, Na, K, Ag; R=rare earth) could be piezoelectric, where we predict a similar mechanism to be active.